Imagine my joy to find a book of Alice Munro short stories, that I had never even read, in a used book store a few months ago. Once I started reading, the discoveries did not cease. A perfectly preserved hand-written boarding pass pressed between the pages fired my imagination, and seemed a particularly suitable accompaniment to a collection of stories about lives revealed yet never fully exposed. Much the way lives really are. Or at least they way they were prior to Facebook. 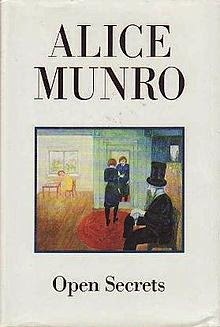 I have always loved Munro's sense of place, the way she uses a particular town and the community who live out their lives there as a lynchpin that links the short stories into a cohesive unit. Although a story may not actually take place there, in fact can take place half a world and half a century away, it is still somehow informed by the sensibilities of the place. Somewhere in the tale is always a reference, overt or sly, to that central place. The stories in Open Secrets are richly told, in true Munro fashion. I have heard her short stories referred to as "shrivelled novels" and there is a lot of truth in that. These are not slices of life, no mere descriptive passages of an afternoon affront. These are fully embodied lives, lived simultaneously with gusto and with reserve. The way lives often are. Many of the stories in Open Secrets end quite abruptly, causing you to turn the page just to ensure that there is not more. The way lives often do. Not one I knew of before. Shriveled novels? Yeah, I'd agree with that assessment. I'm more of a flash fiction sort of guy, but if it's good, it's good. A pithy review ~ I dig it! Will explore more of Alice Munroe for sure. This will gain me little gold stars with my Canadian sister-in-law, a former librarian, while I'm at it. I'm not sure how she does what she does, John, but she puts whole worlds into a few words. Oh yes, Erik, we Canadians get all giddy at other folks reading our own, librarians even more so.